On our camping trip into the more southern areas of Western Australia we spent two nights camping at Bilyuin Pool on the way south and again on the way back north. It was a very quiet area with plentiful bird-life and despite some rather inclement weather in June we really enjoyed the peacefulness of the bush there. Bilyuin Pool is at the site of the old Bilyuin Hotel, which is now in ruin and the pool is the remains of the Murchison River in the winter months. 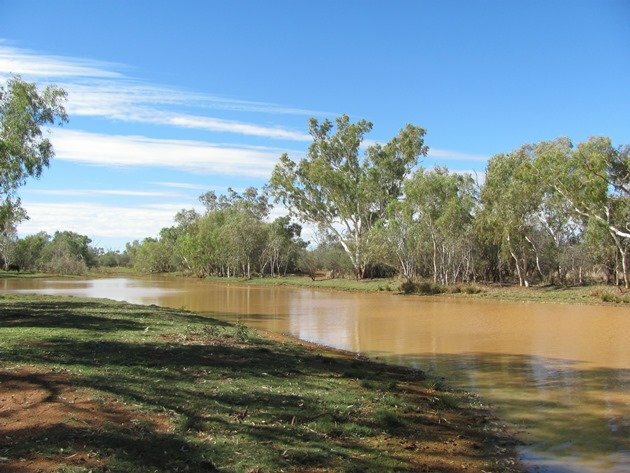 To get to Bilyuin Pool you take the Ashburton Downs road going west from the main highway 75 kilometres north of Meekatharra and it is approximately 14 kilometres from the highway on a good quality gravel road. It may not be accessible at all times if there has been heavy rain, but there will be a sign up if the road is flooded! To get an idea of the area you can look at images from 2004 on Google Earth, because it would appear the satellites don’t go over that area too often! We often find we go to places that satellites don’t go over too often! Bilyuin Pool is at 25 54 18. 17 south and 118 39 46.53 east. Despite it being noted on some “free camping” websites we have never experienced more than two caravans in the whole area and there is plenty of room for everybody to have plenty of space to themselves. Only having a tent means we can head into areas too small for caravans! Arriving at Bilyuin Pool the first time in May we were soon greeted by a family of Australian Magpies keen to see if we were prepared to hand over anything-NO! 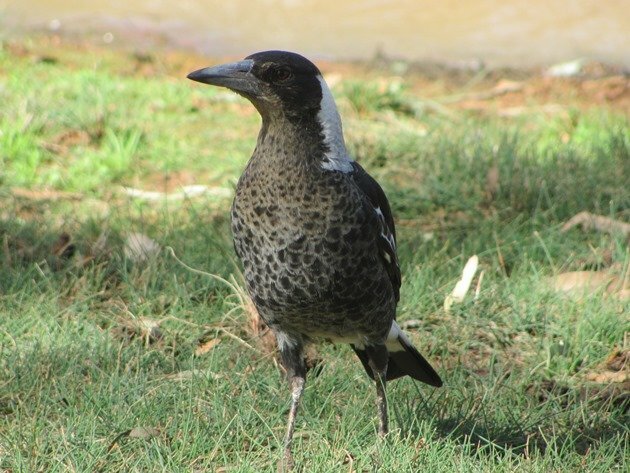 You will note the variation in plumage between the two adults and young. 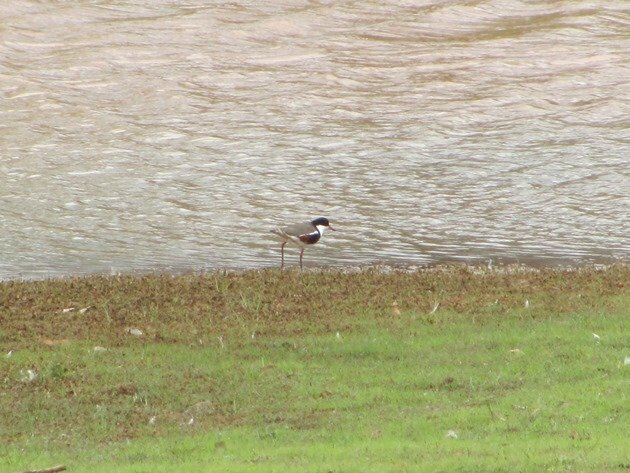 The edges of the pool were active with Black-fronted Dotterels, Red-kneed Dotterels, Magpie-larks and Zebra Finch coming down to drink. At the far end of the pool there were Pacific Black Ducks, Grey Teal, Hardheads, Australasian Grebes, White-faced Herons, White-necked Heron and a surprise visit the following morning of Australian Wood Ducks, which were the first for us for 2016. The Australian Wood Duck left later that day and were not seen again! 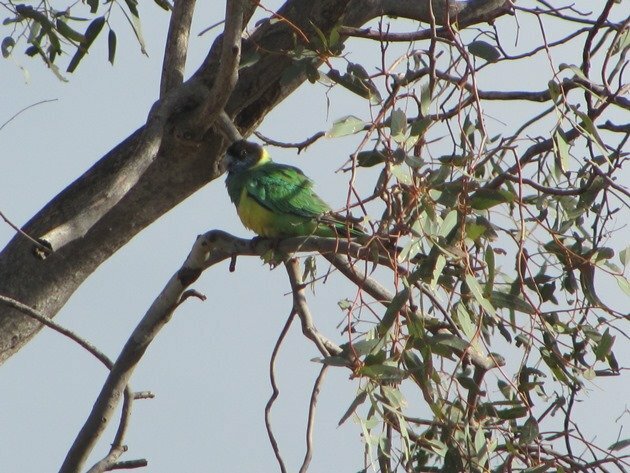 The trees were very busy with Yellow-throated Miners, White-plumed Honeyeaters, Singing Honeyeaters, Spiny-cheeked Honeyeaters, Rufous Whistlers, Grey-crowned Babblers, Western Bowerbirds, Crested Pigeons and Diamond Doves. Sitting quietly the first afternoon we soon added more and more species to our list. Rainbow Bee-eaters were swooping for food and a Sacred Kingfisher was active on the far bank as well. There were Tree Martins swooping across the surface of the pool and Welcome Swallows passed through as well. 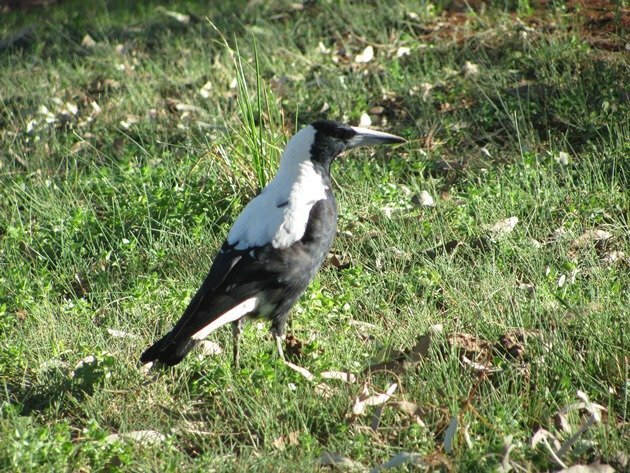 Taking a few hours to walk around the area through a variety of habitats found us adding even more species including Galahs, Cockatiels, White-browed Babblers, Emu (fresh tracks only! 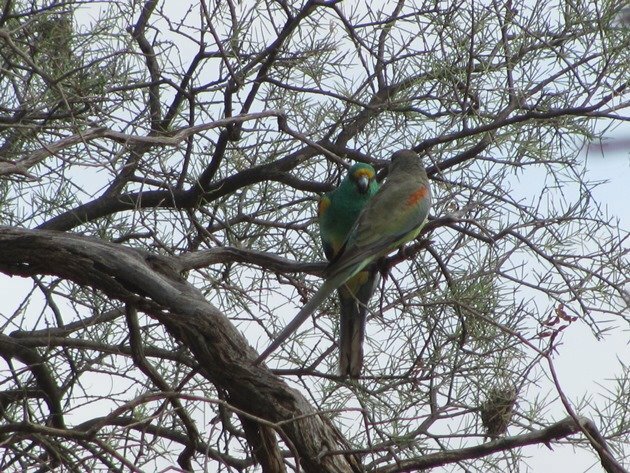 ), Mulga Parrots and Ring-necked Parrots. Our close encounter with two pairs of Ring-necked Parrots was interesting, because two birds were fighting and two were observing. One bird had the other pinned to the ground and was literally ripping its breast feathers out. Grant moved in to separate them and realised there was some competition over a hole in a tree that would no doubt be a useful nest site. Ring-necked Parrot after a fight! Birds of prey in the area included a Brown Goshawk, Australian Hobby and Whistling Kite. 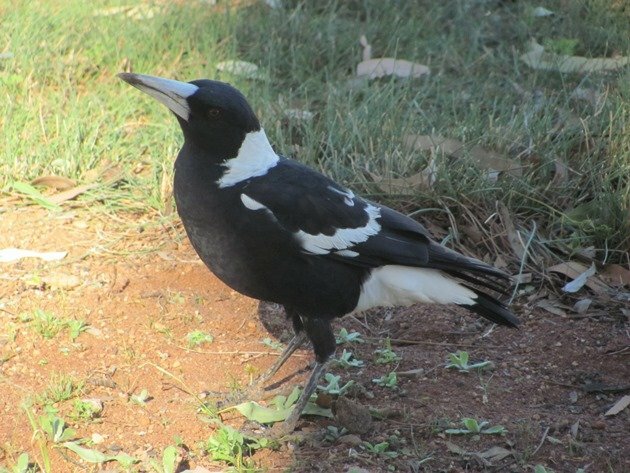 Other species observed over our two visits were Crested Bellbird, Pied Butcherbird, Grey Shrike-thrush, Torresian Crow, Willie Wagtail, Black-faced Cuckoo-shrike, Mistletoebird and Straw-necked Ibis. As with most remote places in Western Australia you do need to be self-sufficient and bring into the area everything you need. The water in the pool may be suitable for bird-life, but is not suitable to drink and holds a lot of sediment in it, so you can’t actually see the bottom even at the edges. There is limited phone coverage due to the proximity of a mine site somewhere in the locality, but it is intermittent and should not be relied on. 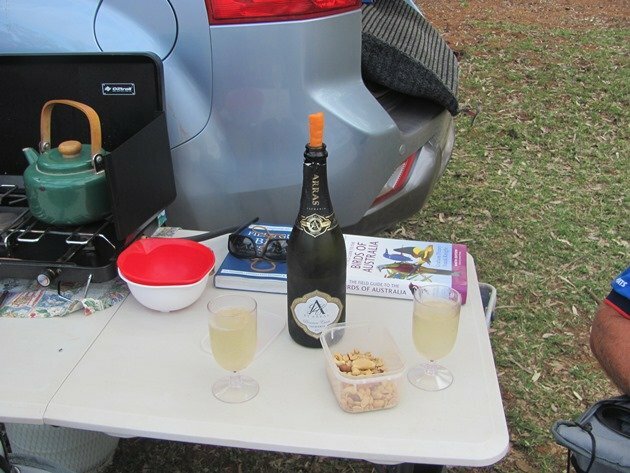 You need to be resourceful when you are in the bush and when we opened a bottle of sparkling wine to celebrate an anniversary we held the bubbles in with a carrot! Being resourceful with a carrot! 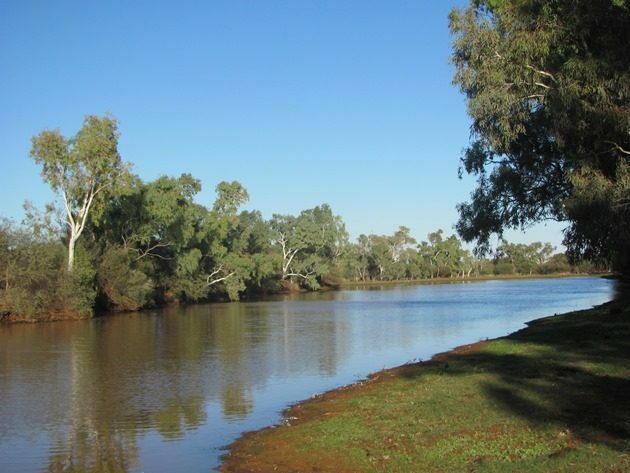 Bilyuin Pool is a great place to drop by for a picnic or to camp with a great variety of bird-life. Please respect the area and take your rubbish away with you! Sadly some people have felt the need to travel with a chain saw and there is evidence of its use around the pool, which is of course disappointing. Sounds like a great trip! I love your Magpie photos and the extraordinary parrots.